With a crushing 3-1 home defeat to Bayern under their belts, not to mention their hopes of qualifying for next season’s Champions League hanging by a thread, a bedraggled and under-pressure Arsenal travelled to Munich to play a side who are currently receiving as much praise as the Gunners are criticism. However, rather than lie down and die, the Premier League side produced an outstanding display, with Bayern a shadow of their much-vaunted selves throughout. Olivier Giroud gave the Gunners the perfect start after just three minutes after good work from Theo Walcott. 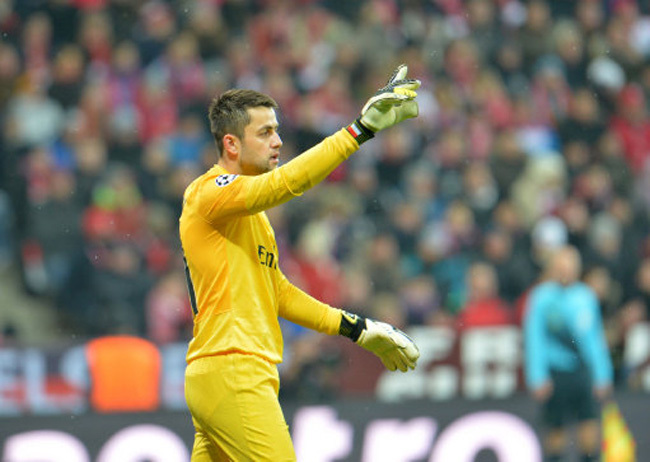 Despite going a goall down, Bayenr struggled to respond as Arsenal looked comfortable in defence. The game looked to be heading to a 1-0 win for the north Londoners when Laurent Koscielny headed home superbly from a corner to set up a dramatic finish. However, in the end, the Gunners (not helped by some poor refereeing) couldn’t find that third goal. Still, a performance like that, with the back five of Gibbs, Mertesacker, Koscielny, Jenkinson and Fabianski playing with a very un-Arsenal-like sense of organisation and solidity, will surely give Arsene Wenger’s men a timely boost ahead of their top four quest. So Chris what happened to your last rash statement that we could play Bayern a 100 times and not beat them? Three weeks later away from home we beat them 2-0 surely time to sit down and tuck into some humble pie? Ramsey started tonight also i’d like to see Fergie keep united in the mix if he had to sell his best players every year to his direct rivals just to balance the books! Lets face it you went down the sensationalist talk sport route of journalism, you’d think any informed football ‘journalist’ worth his salt would think that it might be a bit hasty to fully stick the boot in like that given Wengers track record of turning things around and I have feeling that he’ll do it again this season, using this result as a catalyst. Yeah we got knocked out but it just proved never right Arsenal off! ^^ You’re insinuating that sports journalism should exhibit the essence of expertise. The implicit disclaimer is that this is all for entertainment value. If it were the case that these poor saps had any real inclination towards prognostication, they’d be rich bookmakers, not poor writers. I only clicked on this for the word ‘Pyrrhic’. I’ve just looked it up and I’m not sure you use it in the right context, but it’s a bloody good word all the same. Let us be realistic here: Bayern were off form during a game they expected to walk. 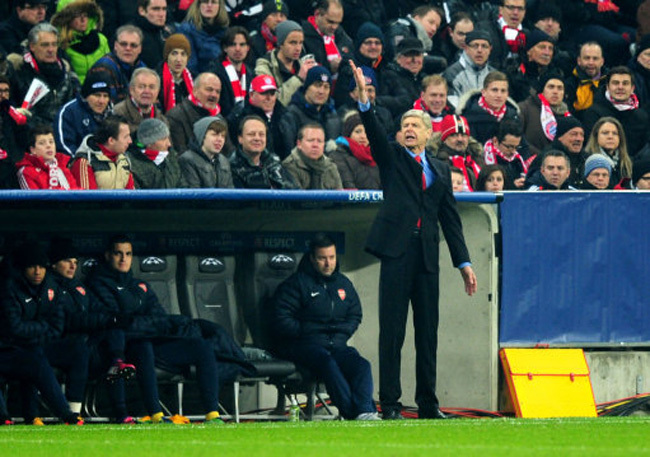 Arsenal were the underdog and were able to take advantage of Bayern’s arrogance. And they caused a surprise upset in the process. It is worth placing Arsenal’s victory in context. No-one in their right minds would suggest that they are a better club than Bayern (one of the top clubs in Europe) nor claim that Arsenal validly deserve a spot in the final 16. They were utterly destroyed in the first leg and bottled it in the second, despite the win. Arsenal, at present, are just not good enough and do not have the bottle to see things through. Using Barca as an example, they knew that they had to score at least three to give them a chance of going through and managed four against a very good AC Milan side that shut them out completely a few weeks previously. Winning 0-2 on aggregate is no use at all if you have already shipped three away goals. They had to win by three and failed to do so. None of this is Arsenal-bashing. It is fact. It is all well and good bashing Chris for his personal opinion but on paper, Bayern should have thrashed Arsenal at home. These things happen. What is hilarious is the lack of objectivity exemplified by some of the Arsenal fans above – one swallow does not make a summer, chaps. If you have any hope of making it into the top four, you will have to buck your ideas up in the league. Arsenal may very well make it into the top four in the Premiership but given the lack of English representation in the CL at this stage, it hardly says much about the overall standard of our league, which is something that Wenger himself has recognised (see his comments of last night). I love your post, Si! I love most of your posts but I cant agree with the “balance the books” bit. PS First time this season I see arsenal players actually pressuring..
Not sure about pyrrhic, Stelling used it last night as well. Bloody hell – “pyrrhic” is only a word! And I do think it fits in here. But whatever, less pedantry and more comments on the game etc please!!! My point is we don’t have the financial clout utd chelsea and city have we are still 250m in debt we have two major shareholders who won’t inject any money unlike the other 3 clubs mentioned. I’m not bashing Chris but i’m sure he’s very happy he has someone to answer for him. He wrote an article stating we couldn’t beat bayern if we played them 100 times are you saying Bayern rolled over and let us win? We were 1 goal away from knocking them out of the competition last season was pretty much the same with a.c and the season before that we beat barca at home and in the away leg van persie was sent off for shooting one milisecond after the ref blew his whistle for off side for wasting time! in that tie Bendtner could have sealed the win but he fluffed his lines in the last few minutes! His last article was ridiculously harsh bemoaning Wenger for starting Ramsey who started this leg which we won whilst keeping a clean sheet. Saying ferguson would start ramsey is pathetic he has Rooney on the bench who is on 250,000 pounds a week does this not put things into perspective a little? I’d like to see Mancini, Ferguson, Mourinho or Guardiola over see a move to a new stadium while selling there best players year after year and keeping there team in Champs league competition in one of the most competetitive leagues in european football. But… was it really an outstandig performance? FCB crushed Arsenal, their only problem was the utterly selfish Robben who almost everytime went solo and fucked things up. I’m not sure about possession but regarding shots on target & created chances Bayern where well ahead. & I can’t imagine them going 100% during the second half, the only time I felt Arsenal where in some kind of control was after the 0-2 goal & that lasted what, 3 minutes? @Alan I refer you to mike. But as for commenting on the match, it was ok but a surprisingly dull affair considering the end result, it only really spiced up after the game when Jeff Stelling called it pyrrhic. @ Mike and Marajona – Im well aware of the meaning of the word. Wenger put out a full strength side to try to win the game, which he did. However, by playing his full team and with them putting in such an effort, it may cost them at the weekend away at Swansea. Wenger could have rested players with the Prem run in, but decided to risk it. I sincerely hope this clears up the pedantry! @duff man, I’d argue that not getting thumped by bayern is going to have a very positive impact. losing heavily could’ve crushed an already fragile team. I sincerely hope this keeps us the pedantry. @marajonna – As an Arsenal fan I sincerely hope you are right and I am wrong!!! I’d agree with marajonna. Wenger couldn’t play Podolski and Wilsh. Both top players. Rested Diaby and Vermaelen plus the polish goalie(too hard to type his name right now). I think losing again against Bayern would’ve crushed their already rushed confidence. I hope they play with faith against a tough Swansea side.